The perfect way to start your day at our luxury Vail lodge before enjoying Vail Village and the great outdoors! The Tivoli Lodge serves a full hot buffet breakfast each morning (fee applies), which changes daily. Creations range from old favorites to new traditions. Start with an assortment of fresh sliced and whole fruit, muffins and pastries, cereals, house-made granola, steel cut oatmeal, and juices. 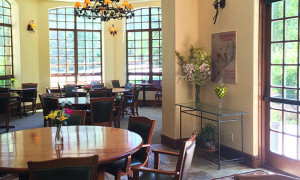 Then enjoy our Vail lodge breakfast’s Chef attended omelet station with all the fixin’s, golden skillet potatoes, freshly made waffles, bagels, the daily scramble, and of course – applewood smoked bacon and savory sausages. 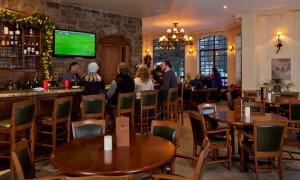 Vail Colorado visitors are definitely barking up the wrong tree if they go anywhere other than the Tivoli Lodge in Vail Village’s Brown Hound Lounge for a relaxing cocktail, micro-brew, or premium glass of wine this season. The Tivoli Lodge’s stunning lobby, cozy and inviting with overstuffed chairs and leather sofas, serves up towering views of the Vail ski resort mountain and surrounding peaks. The Brown Hound offers up a bountifully stocked bar and its signature Indini cocktail – inspired by former Tivoli Lodge mascot Indy, the chocolate Labrador for whom the lounge is named. Russell’s Steakhouse is located on Bridge Street just across from the covered bridge in Vail Village. Russell’s is more than a steak house. They specialize in certified Angus beef, but also complement the steak and prime rib with the finest and freshest fish and Alaskan King Crab. Benvenuti alla bottega! In the summer, lounge on the restaurant’s deck and enjoy some quality people-watching. In the heart of winter, enjoy some of the best Italian food around. Montauk is a great choice for seafood lovers. Located in the heart of Lionshead there is no better place to enjoy fish, lobster, clams or oysters. Dining inside or outside on the patio when available. Vail’s most popular pizza place is voted best in the valley by the locals. Casual dining with great food for everyone. Dinner and bowling couldn’t be more fun at the upscale bowling alley in Vail Village. With a separate bar and restaurant, you will enjoy the fun atmosphere Bol has to offer. Serves the finest Italian dishes and wines in a warm, lively, and festive setting. Located slopeside, at the base of the gondola in the new Vail Square, the Vail Chophouse offers incredible views of Vail Mountain. Serving soups, salads, sandwiches, great steaks and fresh seafood, this restaurant melds a wide variety of delicious entrees with a welcoming staff and a luxurious atmosphere. Located in the center of the new Vail Square and serving hand-tossed NY style pizza, in addition to a variety of subs, salads, appetizers, hot Italian entrees and more, the Moose offers the perfect locale for a fun and casual dining experience. Continental cuisine, an extensive wine list, friendly, efficient service, and a casual, pleasant atmosphere are all ingredients at Blu’s restaurant – serving continuously from 9 a.m. to 11 p.m., seven days a week. From traditional breakfast, to homemade soups, salads, appetizers, sandwiches, and full entrees for lunch and dinner, an intimate bar offers a full selection of beer, spirits, and wine. Located in Vail’s scenic Game Creek bowl, take a short ride up the Eagle Bahn gondola to Eagle’s Nest, where you will be escorted by mountain shuttle during the summer or snowcat during the winter. The magnificent setting is matched with a gourmet, multi-course meal and a superb wine list. At lunch, try the fine dining menu with a casual, family-friendly twist. Apres ski with the specialized menu and beverages. Ride the scenic Eagle Bahn gondola to dinner and make it a spectacular evening with amazing views and creative entrees. Dinner at Larkspur is a widely varied sensory treat of generous proportions. From the elegant surroundings at the base of Vail Mountain, to the impeccable service, to the wonderfully delicious fare, your dining experience will undoubtedly be one that you remember fondly for a long time to come. A contemporary French restaurant located in the heart of Vail Village. The cuisine is light and made from the highest-quality products available. The wine list, featuring French and California wines, has won the Award of Excellence by the Wine Spectator two years in a row. Since its beginnings in 1977 as a small, casual 47-seat restaurant, Sweet Basil has grown considerably in both size and reputation. Located in Vail Village, surrounded by the majestic Gore Range, Sweet Basil has been a must for travelers and locals alike for 24 years.